Dinner at Christina's: New Year, New Post! Well, we have returned safely from our travels - a plane trip to Florida, an 11 hour 15 minute drive to North Carolina, and a plane trip home later. Unfortunately, both of us have colds, or allergies, or something - but glad to be in our own bed and the pets picked up from the boarder! It was great to see family and friends, but as usual always rushed and never seems to be enough time to spend with everybody you'd like, or do all the things you want. I was tickled to see that everybody's house we visited clearly had our Christmas card picture displayed on their fridge. Growing up, my mom always sent out a themed picture of my brother Michael and me - so it just seemed natural to continue now that I'm out on my own! 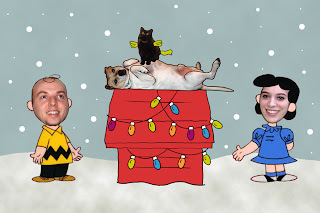 Johnny and I brainstormed until our combined efforts settled on this little Charlie Brown Christmas idea. We just ran with it, too, selecting Peanuts Christmas cards and including Linus' famous Scripture reading from Luke (2: 8-14), where he explains the true meaning of Christmas to Charlie Brown. Johnny is Charlie Brown, I'm Lucy, Corky is good ole Snoopy, in his usual perch atop his doghouse, and Poe (the cat) sprouted wings and a tail for a make-shift Woodstock! I'm really pleased with the way it turned out (thanks to Johnny's expert Photoshop skills) and we heard nothing but raving reviews - so I'm a little nervous about setting the bar too high for next year's card to top it! Speaking of Christmas, I received a lot of great gifts to help me with my new food blogging hobby! Up until this point, I'd been "borrowing" Johnny's camera for all photographic purposes. Not that I'm complaining, because it's a really great camera, that I'll probably still use time to time, but he got me my own! A Canon Powershot with 10.0 megapixels! A slight upgrade from his Sony Powershot 8.0 megapixel. The huge difference is me getting used to taking pictures in a completely different way! Johnny's camera has a huge, manual lens that can zoom in to see like a microscope, while my new one is more of a point-and-shoot model. Both take great, great pics, but it's a completely different way of taking pictures. I got a lot of practice on our Christmas trip - taking about 500 pictures, so I'm starting to figure out the settings and focus, but old habits die hard! Then, you already knew about the Guideposts and Taste of Home gift subscriptions that will be delivered for my reading pleasures, monthly! My mom also gave me a whole collection of cookbooks, ranging in everything from pasta to beef to salads. Be prepared to see some recipes from all in the future. My brother also got me the Food Lover's Companion. This 1 1/2 inch thick book contains more than 6,700 A-Z entries!!! It's like the world's largest index, encyclopedia and dictionary of food, all in one easy to navigate book! I've already flipped through and found a couple things I've made and read about them. I can see it coming in really handy while making things in the future, or even finding out more about ingredients I use. There's explanations about different fruits- including the different apples! You can read about origins of certain foods, even different knives and pans! I'm going to be armed with so much knowledge, I won't know what to do with it -- except pass it onto you guys! And finally ---drumroll--- I received my much coveted immersion blender! No longer will I have to transfer bowl after bowl of soup in and out of the Cuisinart! I am poised and ready to blend - WATCH OUT!